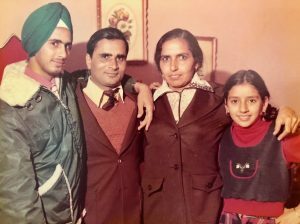 Devinder Mann as a young girl, with her family after immigrating to Canada. My father encouraged me to keep writing letters to our family back home. It was his clever way of assuring I maintained the language skills as well as the wonderful bonds. At lease twice a month we would drive an hour to go watch a Bollywood movie in the theatre, and we never missed a single music concert from India. As a result, I so enjoyed Indian dance that I decided to teach it to myself and make it a hobby. We created our own little world that was strongly rooted with wings to fly. At school, I had now passed out of my ESL class. We were doing debates in our social studies class. Our topic was capital punishment. I was so in my element. With proficiency over the language, confidence in myself, podium before me, and my preparedness, I not only nailed the debate but got the highest mark in the class. I could now feel my feet firmly grounded on this new land. We went and got a fresh tree and decorated it with ornaments my mom knitted. Over the holidays, all the Indian families in our little town had dinner parties and holiday celebrations. I felt so proud to be a Canadian. And my biggest gift came with my report card just before the Christmas break when I actually made it to the honour roll. Almost 45 years later, no success has ever felt so sweet to me. I think it was not just my accomplishment but the realization that hard work and commitment get rewarded. The next few years I felt like a butterfly emerging from its chrysalis of culture shock and self-doubt. It was at this time that I had a very interesting revelation. I knew I would never totally fit in with my Canadian-raised schoolmates nor did I ever feel the need to. I was content and grateful with having a handful of good friends and to be living in a country that encouraged and accepted me for myself. What I did notice though was that I was also not 100 per cent like my Indian friends. In this small town, the majority of the families expected their daughters to be married right out of high school and encouraged them to become good homemakers. I had no such expectations placed upon me. While I took pride in performing Indian dance at my school, I also took jazz dance lessons. I learned swimming and public speaking, and became an integral part of my school and my community. I often wonder if it was intentional or natural for my family to teach me to walk the fine line between my Indian heritage and my empowering new land. How fortunate I felt to be able to make the best of both worlds. It was at this point that I totally overcame any desire to fit in anywhere and I seemed to fit everywhere. How fortunate I felt to be able to make the best of both worlds. It was at this point that I totally overcame any desire to fit in anywhere and I seemed to fit everywhere. My husband and I have raised three adult children on this wonderful land. Our first and foremost mission was to teach them to be the best possible humans they could be without any cultural boundaries or limitations. They have learned to adopt all that serves their lives well and to respect all that is different.